It’s World Menopause Day so I thought I would share the blogs, facebook groups and posts that helped me get through the worst three years of my life. It’s a short list because I’ve edited out the sites that are just trying to sell you something. If you want to suggest more please add them in the comments section below. This might sound like the last thing you need when you are feeling miserable but it is the exactly where you need to be. There are over 14,000 women in this closed facebook group. Whatever you are going though, be it symptoms, emotions or pain you will not be on your own. They will laugh and cry with you and provide support in a safe place. Founded by Rachel Lankester this website has a whole section of informative posts on menopause. The Mutton Club covers lots of alternative stuff too – from diet to yoga, HRT to vaginal dryness. Rachel also manages The Flock which is a fabulous and warm facebook group for midlife women. This site is a mine of clinical information to help you understand what is happening and the treatments that are available. It doesn’t look pretty but don’t be put off. Another community website for women over 40. 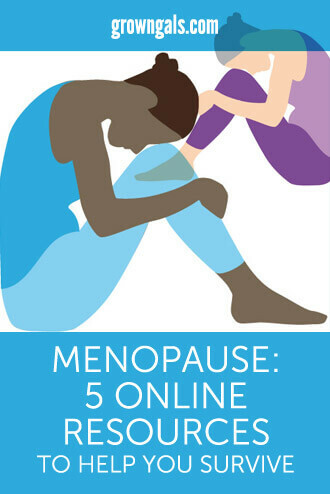 It has a lot of useful information on its menopause hub as well as personal stories. I particularly like the post by Manon Bradley, which is just a really frank piece about how much harder everything is at a ‘certain age’ – even for a powerlifter like her. It makes you realise that you’re tired for a reason! This is The Huff’s menopause archive on its UK site. You can catch up all kinds of posts on menopause including how celebrities have helped to break the taboo on talking about it. Once you’ve digested this lot you might want to read my contributions: Menopause and Going Coconuts and Night Sweats – Sleeping through Menopause. I found that the more I read about other women’s experiences the more normal and less isolated I felt. Take it from me – it does get easier and you will become a stronger and sassier woman in the process.